We have been to the paint store looking at stain for our boat dock. I had no idea that marine seal was not all that was needed. In talking to the professionals, we found out that the wood needed 'restore' to bring it back to life before the stain or seal should be applied. The wood needs to be kept wet while the 'restore' is on the wood, so many details. Then I moved on to the counter with the stains and sealers. You can get matte, gloss, semi-gloss and on and on. The clean up is either soap and water or solvent. What was next was the vast array of colors. Now it is time you understand that I hate making decisions. Starting with the light colors of the Color Gallery (I had no idea white came in so many hues! ), I swiftly moved to the darker side of the spectrum. It was suggested we stay away from the reds, since they fade in the sun to various shades of pink or orange. Thinking and dreaming for days on the stains and repair, the word 'stain' itself kept lingering in my mind. The cross then appeared in my mind, the blood that had dried and stained the wood. The wood that had not had been 'restored' and was now stained in red. The blood of Christ was (1) sacred blood. It was the blood of perfect man - the God Man. (Jn. 1:1,14), the lamb of God (Jn. 1:29). Since Christ alone was perfect God and perfect Man (Phil. 2:5-8), He alone was qualified to give His blood as the atonement for sin. Christ's blood was also (2) sinless blood. His blood was like a lamb without spot or blemish (I Pet. 1:18-19). All other human blood has been tainted by the corruption of sin resulting from Adam's fall (Rom. 5:12, I Cor. 15:22), but the blood of Christ contained none of the sinful corruption which permeated all other humanity. When Judas Iscariot betrayed the Lord Jesus he knew that he was betraying "innocent blood" (Matt. 27:4). The wood of the cross had not been 'restored' and the blood was sinless. The wood was probably weathered and worn, like me, but the blood had no imperfections in it, no sin. It was the perfect blood of Christ and Him alone. He made a decision a long, long time ago, in the beginning of time to die for me. He did not hesitate like I have on staining a plain, old boat dock. My stain is imperfect, it has to be mixed and the wood needs to be restored and ready to receive it. 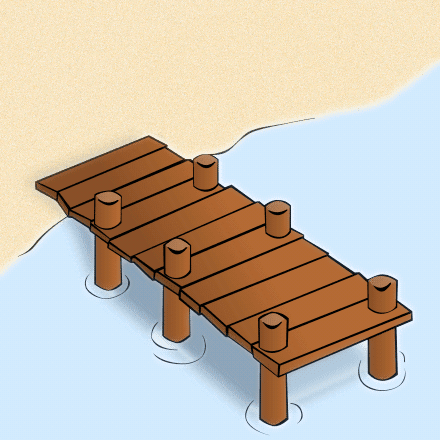 This dock is so like my life, needing to be restored and made ready. I keep letting this battered world 'weather' me and have to be made 'new' in Him everyday. Thank you Lord for providing the 'stain' that is called the Blood of Christ that was shed for me. It will never need redoing in 5-8 years, it will last throughout eternity! Thank You for making that decision for me, so that all I needed to do was to say yes to You. Thank You for the renewing 'restore' that is always on standby when I mess up! Thank You for sealing me with the Blood! Should We Ever Move the Past Forward? What happened? Why did we let it happen? I remember sitting in Sunday School and being told to read my Bible everyday. There was a little box on the card to check if you had done your 'daily Bible reading' that week. I probably checked that box, even though I had not opened my bible everyday. God forgive me. But, did NOT reading my bible daily cause the world to be where it is today? I am sure I did not help matters in the world, but more importantly...my own life. If we could go back, should we dig up the past, listen to the music and read our bibles? I think we could renew our lives by both of these things. For some reason, music does touch the soul. 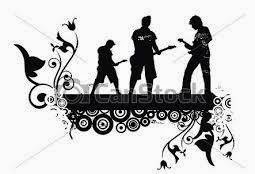 It doesn't matter what style of music you like, when you listen to your style it can touch you. It reaches down into the depths and draws you to a 'place' where it can speak to you. If we get back to the basics of reading our bibles and pay attention to what goes into our ears, we can be renewed. There is nothing wrong with letting the past move us forward, especially when it is growing us to a closer relationship with God. Stand up for your beliefs that are based on Truths and let's move forward together, growing in Him. When I was growing up, I loved adventure. I guess, being the youngest of two girls, I was a Daddy's girl and I was outside most of the time with him. He was always busy on the farm or tractors and he let me tag along. I was his 'Gopher'....go for this and go for that! But, we laughed a lot and I learned a lot, including the love of being outside. I still rather be outside any day, than inside (except in cold weather)! This explains why today, I still love adventure. I love traveling to see things, even if it is just a ride down the river. The enjoyment of 'piddling,' as my husband calls it, is a joy to me, if it is outside. When I have inside chores to do, I want to get them completed early in the day, so if the opportunity comes up that takes me out into nature, I am ready. I am always ready to 'go' somewhere and do something. This is probably the reason we felt led to be with the Billy Graham Rapid Response Team. We were always ready to roll on a moments notice. Look at your life. What do you enjoy doing? Why do we do what we do? Is it out of habit? Is it out of memories of growing up? Is it the environment where we were raised? Is it something that is learned or is it something that we naturally do? But yet, in another thought, Jesus used the disciples in special ways because of their background and their talents. He used Matthew, who was a tax collector, to write about the episode of paying the taxes in Matthew 17. In the same scripture, he used Peter the fisherman, to get a hook and go catch a fish. In the fish's mouth was a coin to pay the taxes. In the same way, God uses our giftedness and talents for His glory. Everything we do and say should be to edify Him. Yes, I know I said 'everything' and I also know that we don't do that. That brings us back to Paul's statement in Romans 7:15, we do not practice what we want to do, but do what we hate, that which more than likely pleases ourselves. This is where we can grow, encouraging each other in our gifts and talents and to use them. We not only can grow ourselves when we encourage others, but that helps them to step up and out of their comfort zones to be used. This was on my heart this past week, to encourage you, the reader to step out in faith. Listen to the call of God on your life. It may be what you love to do already from the past and growing up as a child. Use whatever gift or talent God gave you and what you have learned. Do not let it go by the wayside, use it for Him. It is never to late in life to start giving back to Him. You can be a blessing to others when you serve in the Name of Jesus. We have friends that have just retired from their worldly careers and have stepped out in faith to serve. One friend, Tim, has left his family for the summer to volunteer and serve in Alaska for two months with Samaritan's Purse. Another couple, Glenn and Julia, are volunteering for a month in Alaska, to serve with Operation Heal Our Patriots. All this is in the Name of Jesus, giving Him their time and life this summer for others. When they get to heaven, I pray we can stand in line beside them to hear Jesus say to them, "Well done my good and faithful servants."